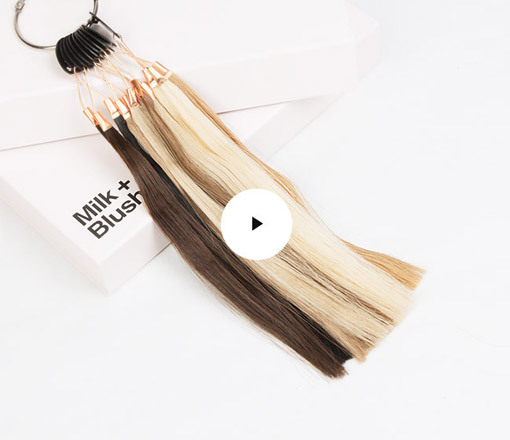 Get longer, thicker and more beautiful hair: instantly transform your hair with Milk + Blush quad weft hair extensions and feel more confident than ever. Made entirely of clip-in lace quad wefts, our Luxurious set contains more hair but on fewer clips. This means a thicker, natural result that’s more comfortable for you to wear. Ever wonder how some hair extensions look so much more luxurious than others? Well, not all hair extensions were created equally. It’s all down to the amount of hair in the set: for some daytime looks, medium and thick hair extensions are just perfect, but for that ‘how is your hair so beautiful’ look, more hair is the way forward. Our Luxurious set is made entirely of lace quad wefts. Each weft has four layers of hair sewn onto it, this means there is more hair in the set but without the need for additional clips. It’s like combining a few sets of hair extensions into one. Quad weft hair extensions are easy to clip in, and very comfortable to wear. The 256g set contains a sufficient amount of hair for beautifully thick, oh-wow results. Milk + Blush recommend quadruple weft hair extensions for all hair types; they work well if your hair thickness is fine, medium or thick.